Suzanne Domoracki, Program Director, Nevada Drug Card & Kiemmy Boc Thai, CMN director, Renown Children’s Hospital. 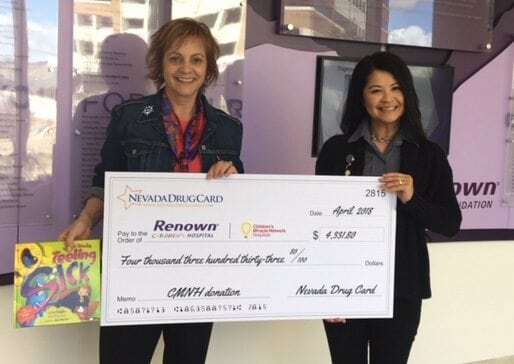 Nevada Drug Card is pleased to present a check to Renown Children’s Hospital. Nevada Drug Card Program Director, Suzanne Domoracki presented a check to Kiemmy Boc Thai, CMN Director, Renown Children’s Hospital. These donations will help fund educational programs for the children along with providing state-of-the-art equipment. Nevada Drug Card is an invaluable resource for patients purchasing prescription medications and It’s important to know that each time you choose to utilize Nevada Drug Card, you choose to give back to your local hospitals. *Donation amount represents total donations since 2016.